“A” for “Adorable” | Spaceship! Spaceship! Spaceship! It was only a few days ago we featured this teeny-weeny Viper from Battlestar Galactica; and now a whole squadron of cutie-pie craft have flown in from the world of Glen A. Larson courtesy of SPARKART!. 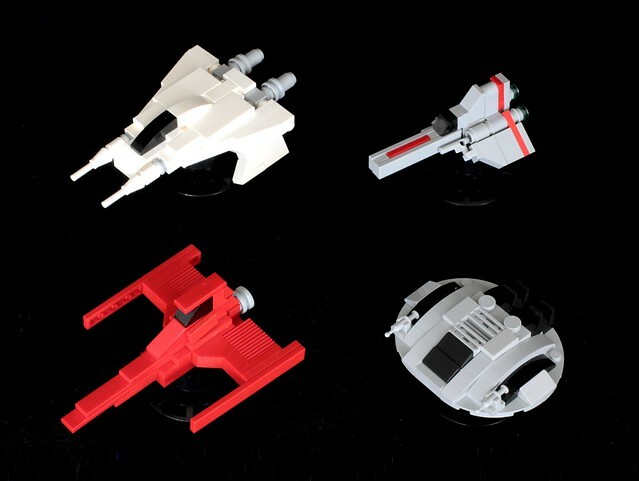 Larson is of course the producer of the seminal TV series Buck Rogers in the 25th Century and Battlestar Galactica; from which we find here on the left Buck Rogers’ Thunder Fighter and Draconian Marauder and on the right BSG ‘s Colonial Viper and Cylon Raider. I’m especially digging the Thunder Fighter, the design of which has stood the test of time remarkably well, and all the models capture the iconic silhouettes, colour schemes and an incredible level of detail for such tiny model with minimal parts. This entry was tagged Battlestar Galactica, Buck Rogers, microscale, MOC. Bookmark the permalink.